12/27/2018: Finished Task 1 and 2. Completed Book Task. 3 points altogether. I'm hoping to get one more point out of this door by watching a Christmas movie, but I'm not sure that will actually happen. Post a picture of your Christmas decorations. I had to dig these out. We haven't done Christmas decorations in our household since I was in high school and my elder brother put up a Christmas tree. Afterwards, no one wanted to take it down, so it sat for another month before my parents finally got fed up with telling my brother to clean up the Christmas decorations and put it away. 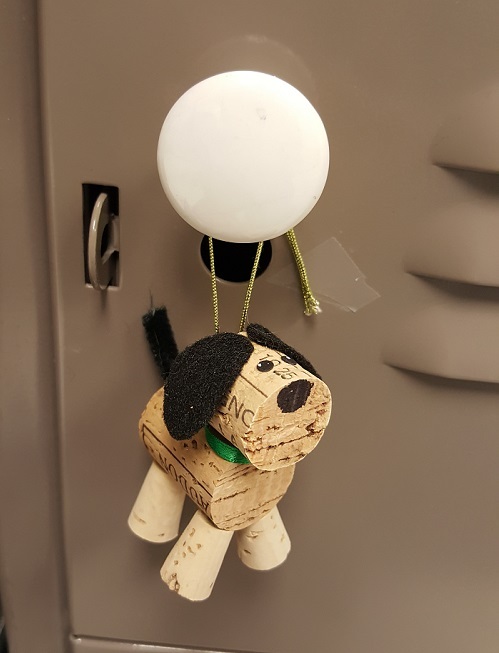 Also, here's a dog cork decoration a coworker gave me this year to add to my collection. 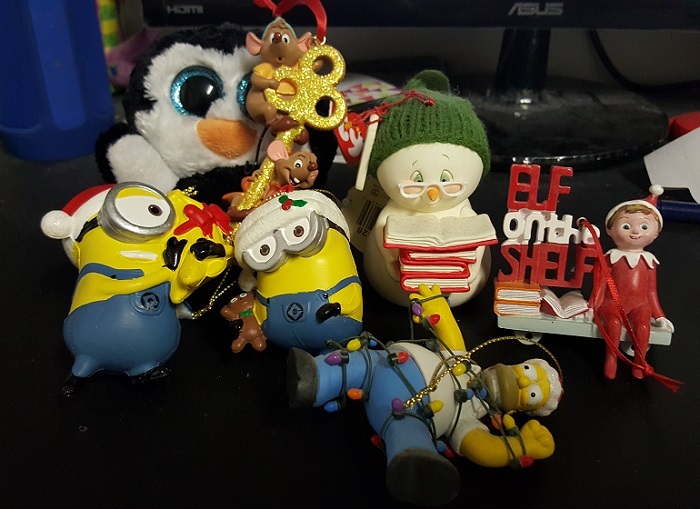 It is currently hanging on my work locker for a little bit of holiday cheer! Tell us: If you could share Christmas dinner with any author (dead or alive), who would it be? I think I'd love to share Christmas dinner with either J.K. Rowling or Susanna Kearsley. Somehow I think they would have wonderful dinnertime conversation! I'd love to ask them about their insights on their work, and I'd love to pick their brains about their naturally humorous character dialogues and interactions. Watch a favorite Christmas movie. Hmm... I haven't watched Love Actually in a very long time. I think I might have to break it out. Fun tidbit, I used to watch this movie every year during the holidays. For some reason, I stopped at some point some years ago and I can't even pinpoint when exactly, nor why. 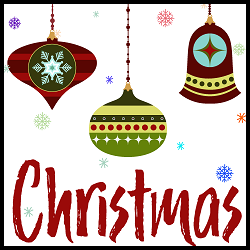 Create or recreate a short text relating to Christmas (poem, carol, wish list, season’s greetings, etc.) from the titles of books on your bookshelves. 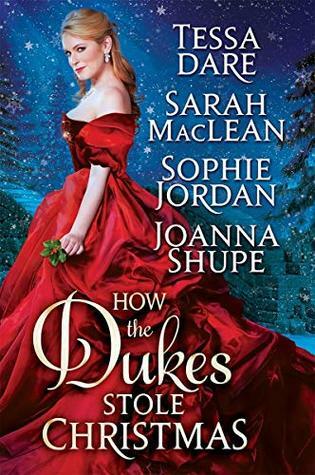 I managed to finish reading this one right before Christmas Day and had fun with it! A review will be posted soon.